And yet this is the real magic of The Last Story — the effortless way in which it cements the importance and, indeed, nobility of things we thought we outgrew, or at the very least were sick of. Things like cutscenes, yes, but also things like stories about destiny and forbidden romance; things like pirate ships and castles and wicked kings and noble knights; things like princesses who are fed up with their boring lives of royalty, and hidden caves filled with frightening creatures; things like mystical forests and fiery volcanoes and villages full of simple folk who want nothing more than to sell you shields and potions. Things that have been slightly rehashed and moderately relabeled ad nauseum in every Final Fantasy game you’ve played in the past seven years, but which are presented here in The Last Story with an essential ingredient that has been missing in nearly all of them: sincerity. Never mind that the storytelling present here is genuinely good, the performances are genuinely dedicated and the art direction is genuinely some of the best you’ll see this year. 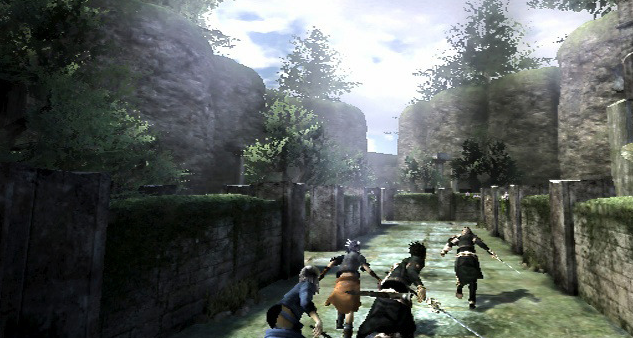 The comparisons to Final Fantasy are inevitable seeing as the game was directed by the man who invented the series, but Hironobu Sakaguchi (who has now left the series to work on original games with his new company, Mistwalker) should be proud to be one of mainstream gaming’s few creators who possess a truly distinctive style. We see his hand in the art direction, which is a perfect expression of Sakaguchi’s love of Medieval architecture, here mostly unmarred by the tired trope of steampunk; we see his hand in the characters, whose personalities are immediately apparent, yet whose motives are ambiguous enough that we want to get to know them better; and we see his hand in the story itself, which (again, in contrast to the current, Sakaguchi-less Final Fantasy) thankfully cares more about charming us with its characters and astounding us with its imagination that it does boring us with pointless mythology that we will forget by the end of the game. Yes, The Last Story spins a good old-fashioned yarn about a band of mercenaries who go on spectacular adventures in which mysterious islands are explored, pirates are fought, treasures are plundered, sick children are cured, and princesses are saved; but even if you didn’t grow up obsessed with Treasure Island and The Legend of Zelda and therefore aren’t a total sucker for fantastical adventure stories like I am, it’s nearly impossible not to be impressed by the sheer innovation of the gameplay itself. RPGs have long featured team-based battles, but rarely have they actually felt like teamwork, so much as they often feel like I press a bunch of buttons on a bunch of menus to make a bunch of people do a bunch of stuff. In The Last Story, you only control one member of your party (Zael–yes, silly names are present and accounted for) yet you must rely on everyone in it. You are just a…well, a role player in this team, but as a result of actually having to rely that team instead of directly controlling their every move, you end up caring about them, even respecting them more ; in effect, the times where you are in fact able to give orders to your team-mates are more exciting due to their relative rarity. This is an accomplishment. I’ve often felt a disconnect in RPGs in which the story tells me I’m supposedly an innocent underdog, yet behind the controller I’m a godlike presence controlling the decisions of not only my avatar but everyone around him. It just doesn’t feel true. It’s like in Grant Theft Auto IV where Niko’s cousin tells him “We’re broke!” and yet we look up at the top of the screen and see we’ve amassed several hundred thousand dollars from our dirty work. In The Last Story I have found no such disconnects, and if they’re there, I’ll happily ignore them. There is no such thing as a perfect game; it’s just that some are better at distracting us from their flaws. I’ve set the game on the shelf for now, but not for a lack of interest or boredom; I’m savoring the experience. I’m waiting for a rainy day to come along, or a sleepless night, where I can curl up on the couch and be swept up in more of the gang’s adventures; reminded of the times when I’d stay up all night with my favorite book, immersed in the escapades of pirates or knights. The Last Story, of course, is not the last story, but it is the first game story in a very long time that I’ve cared about. It’s funny to read such effusive praise about The Last Story. I bought it when I picked it up and liked the setting and story enough (telegraphed though it was a few hours in, for the most part) but what’s lost me is the gameplay. Combat just feels so… mushy, for lack of a better word. It aims for the same ends as the FFXIII engine and I’d say it is definitely better than that mess, but my actions largely feel inconsequential and once the boss’s quirk is discovered, it feels like it’s just a matter of waiting — for a while, to boot — before he falls over. I thought I maybe was burnt out on RPGs, picking this up right after Xenoblade, but instead I beat Final Fantasy (the first) and Pokemon Black 2 beginning to end, so I don’t think that’s it. Am I so wrong for missing battles like we found in FFVI, where actions in battle had serious consequences and new levels, spells and equipment could radically alter how a character was played? I love Chrono Trigger, do not get me wrong, but was the problem with the SNES FF games really that the combat was too slow? Or, for a less high-minded and more topical question, am I missing something with Last Story? Should this find its way back off the shelf some time over the holidays? The thing with the Last Story is that it’s more of an action game with heavy RPG elements, and not the other way around. Its combat isn’t really worth comparing to Final Fantasy VI, as it isn’t really trying to be anything like it. The joy of the Last Story’s comat comes more from its energy, the fun of leaping off your team-mate’s back and slicing a skeleton dude, which is well in line with the game’s action-packed, swashbuckling tone.